Prague is the capital of the Czech Republic. Into its present-day shape it has been developing for eleven centuries. 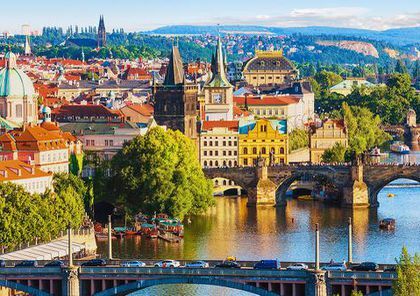 Prague is situated in the very heart of Europe, on a place that has been an intersection of continental merchant routes since time immemorial. It was the seat of Czech princes and kings from the tenth century A.D. In the mid-14th century, Prague was the centre of the Holy Roman Empire and Europe’s third largest city in terms of population. As part of the Hapsburg monarchy, Prague remained the capital of Czech lands, which became the strongest part of the Austro-Hungarian Empire in terms of economy during the 19th century. Prague was developing as an important centre where Czech, German and Jewish cultures met and mingled. Following the establishment of the Czechoslovak Republic in 1918, Prague became the metropolis of the new country. It experienced a growth of its territory and a great building boom. Currently, Prague is a large city of more than one million people, spreading over almost 500 square kilometres. Following the social and economic changes in 1989, Prague enhanced its historically strong ties with other cities in Central Europe, and has gradually been gaining a continuously improving position within the continental structure of big cities. Praguetherefore deserves its recognition as being a high quality city.